The company behind the only EPA-approved pesticide for feral hogs has withdrawn its request for registration in Texas. But that doesn’t mean the battle over the warfarin-based poison’s safety is finished. 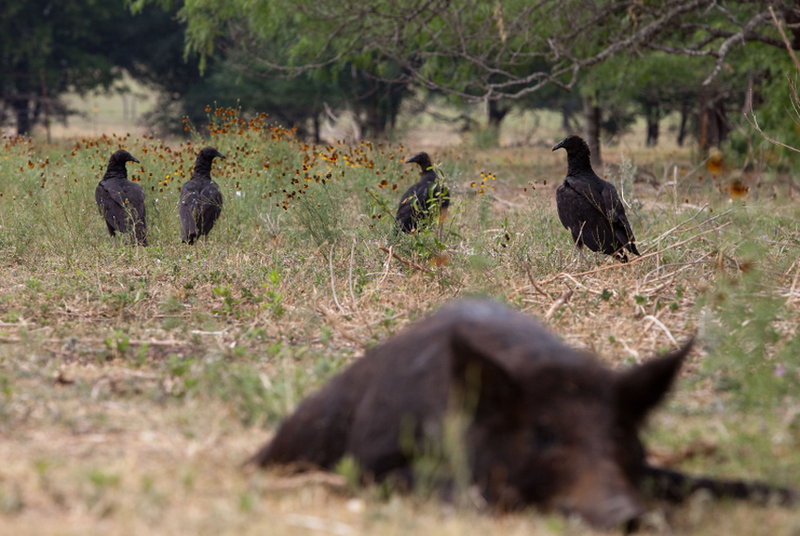 Citing the threat of lawsuits, Scimetrics, the company behind the only EPA-approved pesticide for feral hogs, announced Tuesday it had withdrawn its request for registration in Texas. But that doesn’t mean the battle over the warfarin-based poison is finished — or that the product known as Kaput won’t eventually make it to the state. The company has "discontinued [its] attempts to provide this resource in Texas at this time," according to a news release. "Under the threat of many lawsuits, our family-owned company cannot at this time risk the disruption of our business and continue to compete with special interests in Texas that have larger resources to sustain a lengthy legal battle," the release read. Agriculture Commissioner Sid Miller, who has championed the poison, called Scimetrics’ decision "just another kick in the teeth for rural Texans" in a Tuesday news release. There are no restrictions on the company seeking re-registration in the future, said Mark Loeffler, a spokesman for the Texas Agriculture Department. Loeffler said the department was honoring the company’s request to remove its application but would continue an already-in-motion process to establish rules governing the use of the poison in the state. The department held a public hearing on the rules in Waco on Monday. The owner of Scimetrics, Richard Poche, did not return a request for comment. The news comes a week after a bill that would require state agency or university research before the use of lethal pesticides on wild pigs overwhelmingly passed the Texas House. The measure has yet to be scheduled for a hearing in the Senate Committee on Agriculture, Water & Rural Affairs. A state district judge temporarily blocked the agriculture department's emergency rules in March after Herring, joined by the Texas Hog Hunters Association and the Environmental Defense Fund, brought a lawsuit arguing it would hurt the meat and hunting industries. Herring’s company, which buys feral hog carcasses to sell to pet food manufacturers, said the proposal had already caused an out-of-state client to pull out of contract negotiations. When the Texas Department of Agriculture announced the poison in February, Miller said it would be a vital weapon against the state’s population of over 2 million wild hogs and the damage they do to crops, wildlife and the environment. “The ‘Hog Apocalypse' may finally be on the horizon,” said Miller, who as a state legislator authored a 2011 measure known as the “pork-chopper bill” that allowed the hunting of hogs by helicopter. But since then, a diverse coalition of hunters, animal rights advocates, conservationists and meat processors has mobilized against it. They have raised concerns about its safety and say too little is known about its potential effect on ecosystems and other wildlife. Kaput’s active ingredient is warfarin, which at varying concentrations is used as a rat poison and as a blood thinner in humans. Dispensed through special feeders that have weighted lids intended to limit other animals’ access, it causes hogs that consume it to die of internal bleeding. The product’s label says this process can take four to seven days. Use instructions warn against allowing livestock to graze or hunting in areas around the baited feeders until at least 90 days after removing the poison. Carcasses must be buried 18 inches under the ground or, if that’s not possible because of environmental conditions, removed from site. The agriculture department has defended the poison, saying the state rules would impose stricter restrictions than the EPA, including limiting use of the poison to state-licensed pesticide applicators. Miller's news release lamented Scimetrics' decision, saying, "Unfortunately, it seems that once again, the hard-working folks who turn the dirt and work from sunup to sundown have fallen victim to lawyers, environmental radicals and the misinformed. Once again, politically correct urban media hacks and naysayers win out against the rural folks who produce the food and fiber everyone needs."